The Short- Million Dollar Arm might be packed to the brim with those Disney sports movie clichés but thanks to a fantastic cast and satisfying story it still manages to be a worthwhile sports flick. Jon Hamm and Lake Bell have great chemistry and Suraj Sharma (Life of Pi), and Madhur Mittal(Slumdog Millionaire) may not get as much screen time as you would hope for but both take advantage of each and every moment with two good performances. To say the trailer for Million Dollar Arm was not totally enticing would not be far from the truth, it looked bland and not too much fun to sit through. Maybe the point was for Disney to say “We don’t want to give away the WHOLE movie in the trailer (even though most trailers give away most of the first half of the film) let’s hope the movie speaks for itself”. Either way Million Dollar Arm was much better then what I was expecting or that has a lot to do with its cast. Led by Jon Hamm (Mad Men), Lake Bell (In A World), Aasif Mandvi(The Daily Show), Suraj Sharma (Life of Pie), Madhur Mittal(Slumdog Millionaire) and comedic relief Pitobash the cast works very well together. Some members of that cast that stuck out to me besides the good work from Jon Hamm the film gets solid work from the always charismatic Lake Bell and the guys who are the basis of Million Dollar Arm Sharma and Mittal. Million Dollar Arm takes the true story of down on his luck sports agent JB Bernstein (Hamm). Following the failed attempt to sign an NFL star Linebacker (real life Cincinnati Bengals linebacker Rey Maualuga) JB and partner Aash (Aasif Mandvi) are forced to come up with a creative idea to save there agency or lose it all. Following a rough night JB comes up with the idea of finding Major League Baseball’s first baseball player from India. He creates a nationwide search for Cricket players to work their way to a Major League tryout. Million Dollar Arm is directed by Lars and The Real Girl helmer Craig Gillespie and written by Oscar nominee Thomas McCarthy (Win-Win, Up). Gillespie’s direction helps create some drama especially during the baseball sequences, McCarthy’s script is at times funny but he also goes to the sports movie clichés on more than one occasion which takes away from moments of the film that are meant to feel more natural and less manufactured. 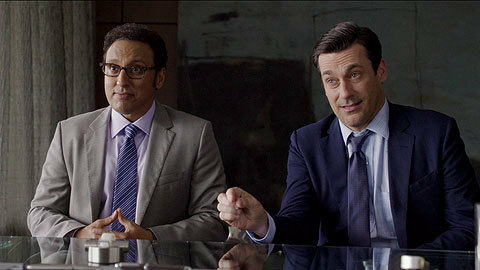 The real winner from Million Dollar Arm is the casting director, not only did they score Hamm who fits the bill of a LA based sports agent, but the casting of Sharma, Mittall and Pitobash who seem to gel very well together and they also are the ones that create the plenty of memorable moments as the fish out of water young boys from the middle of the sticks in India that are now transported to LA. Million Dollar Arm also includes a number of fantastic supporting cast members led by Lake Bell as JB’s friendly neighbor and Alan Arkin who appears in stretches of the film as a cranky baseball scout who is helping JB find his two stars. Don’t get me wrong the movie isn’t perfect, the predictable plot slows down halfway through and the filmmakers spend less time on the three boys and more time on JB even though the boys leave India for the first time, most of the fish out of water scenes which could have been very funny occur off screen with a few lines of dialogue in the next scene that fills In the holes. They spend more time on a plot about JB trying to sign a big name NFL Linebacker then is desired considering the movie is about the Million Dollar Arm contest and not about JB saving his agency( even though that particular plot remains the focal point throughout). Million Dollar Arm may be a cliché Disney sports movie but like those who came before it, Million Dollar Arm is as satisfying a movie you will watch in 2014 thus far. For all of its faults I found myself enjoying each moment even though the conclusion became more and more obvious as the film moves forward. Million Dollar Arm is not the perfect film, but it was a funny, well-acted effort that may struggle at the box office thanks to a crowded next few weeks but it is still a fun sports movie that will satisfy both adults and children. WATCH FULL MOVIE FREE 100% WORKING CLICK HERE ??? ?